Mike calls Analytics the killer app of the 7000 series NAS appliances. Indeed, this feature enables administrators to quickly understand what’s happening on their systems in unprecedented depth. 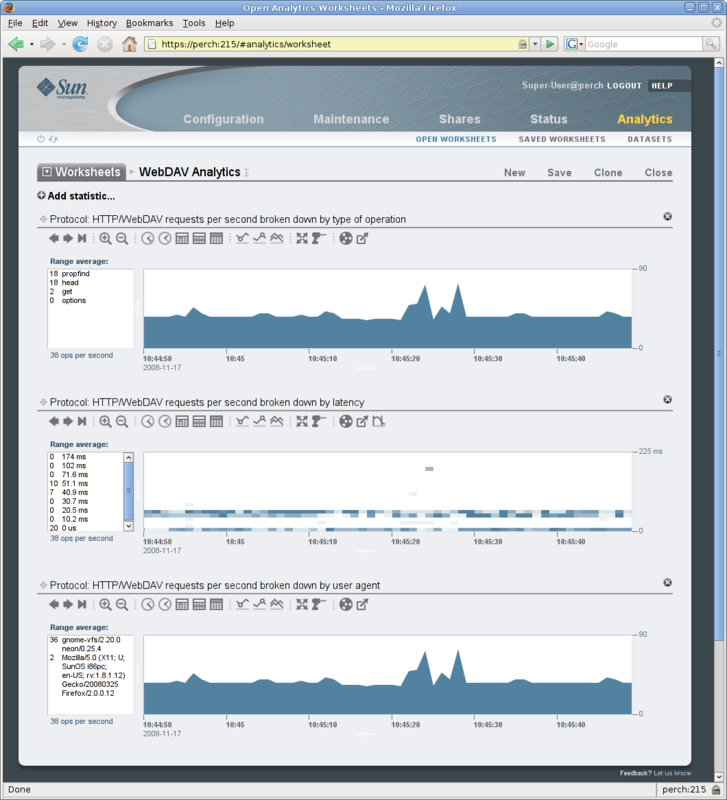 Most of the interesting Analytics data comes from DTrace providers built into Solaris. For example, the iSCSI data are gathered by the existing iSCSI provider, which allows users to drill down on iSCSI operations by client. We’ve got analogous providers for NFS and CIFS, too, which incorporate the richer information we have for those file-level protocols (including file name, user name, etc.). We created a corresponding provider for HTTP in the form of a pluggable Apache module called mod_dtrace. mod_dtrace hooks into the beginning and end of each request and gathers typical log information, including local and remote IP addresses, the HTTP request method, URI, user, user agent, bytes read and written, and the HTTP response code. 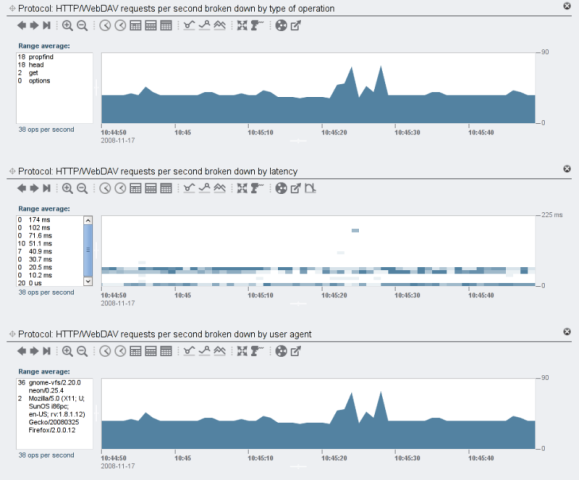 Since we have two probes, we also have latency information for each request. We could, of course, collect other data as long as it’s readily available when we fire the probes. One thing to keep in mind when analyzing HTTP data is that we’re tracking individual requests, not lower level I/O operations. With NFS, for example, each operation might be a read of some part of the file. If you read a whole file, you’ll see a bunch of operations, each one reading a chunk of the file. With HTTP, there’s just one request, so you’ll only see a data point when that request starts or finishes, no matter how big the file is. If one client is downloading a 2GB file, you won’t see it until they’re done (and the latency might be very high, but that’s not necessarily indicative of poor performance). This is a result of the way the protocol works (or, more precisely, the way it’s used). While NFS is defined in terms of small filesystem operations, HTTP is defined in terms of requests, which may be arbitrarily large (depending on the limits of the hardware). One could imagine a world in which an HTTP client that’s implementing a filesystem (like the Windows mini-redirector) makes smaller requests using HTTP Range headers. This would look more like the NFS case – there would be requests for ranges of files corresponding to the sections of files that were being read. (This could have serious consequences for performance, of course.) But as things are now, users must understand the nature of protocol-level instrumentation when drawing conclusions based on HTTP Analytics graphs. http.d defines http_reqinfo_t, the stable structure used as an argument to probes (in D scripts). This file also defines translators to map between httpproto_t, the structure passed to the DTrace probe macro (by the actual code that fires probes in mod_dtrace.c), and the pseudo-standard conninfo_t and aforementioned http_reqinfo_t. This file is analogous to any of the files shipped in /usr/lib/dtrace on a stock OpenSolaris system. http_provider_impl.h defines httpproto_t, the structure that mod_dtrace passes into the probes. This structure contains enough information for the aforementioned translators to fill in both the conninfo_t and http_reqinfo_t. mod_dtrace.c implements the provider itself. We hook into Apache’s existing post_read_request and log_transaction hooks to fire the probes (if they are enabled). The only tricky bit here is counting bytes, since Apache doesn’t normally keep that information around. We use an input filter to count bytes read, and we override mod_logio‘s optional function to count bytes written. This is basically the same approach that mod_logio uses, though is admittedly pretty nasty. We hope this will shed some light on performance problems in actual customer environments. If you’re interested in using HTTP/WebDAV on the NAS appliance, check out my recent post on our support for system users. In building the 7000 series of NAS appliances, we strove to create a solid storage product that’s revolutionary both in features and price/performance. This process frequently entailed rethinking old problems and finding new solutions that challenge the limitations of previous ones. Bill has a great example in making CIFS (SMB) a first-class data protocol on the appliance, from our management interface down to the kernel itself. I’ll discuss here the ways in which we’ve enhanced support for HTTP/WebDAV sharing, particularly as it coexists with other protocols like NFS, CIFS, and FTP. WebDAV is a set of extensions to HTTP that allows clients (like web browsers) to treat web sites like filesystems. Windows, MacOS, and Gnome all have built-in WebDAV clients that allow users to "mount" WebDAV shares on their desktop and treat them like virtual disks. Since the client setup is about as simple as it could be (just enter a URL), this makes a great file sharing solution where performance is not critical and ease of setup is important. Users can simply click their desktop environment’s "connect to server" button and start editing files on the local company file server, where the data is backed up, automatically shared with their laptop, and even exported over NFS or CIFS as well. Many existing HTTP/WebDAV implementations consist of Apache and mod_dav. While this provides a simple, working implementation, its generality creates headaches when users want to share files over both HTTP and other protocols (like NFS). For one, HTTP allows the server to interpret users’ credentials (which are optional to begin with) however it chooses. This provides for enormous flexibility in building complex systems, but it means that you’ve got to do some work to make web users correspond to something meaningful in your environment (i.e., users in your company’s name service). The other limitation of a basic Apache-based setup is that Apache itself has no support for assuming the identity of logged-in users. Typically, the web server runs as ‘webservd’ or ‘httpd’ or some other predefined system user. So in order for files to be accessible via the web, they must be accessible by this arbitrary user, which usually means making them world-accessible. Moreover, when files are created via the WebDAV interface, they end up being owned by the web server, rather than the actual user that created them. The user experience goes something like this: on my Mac laptop, I use the Finder’s "Connect to Server" option and enter the appliance’s WebDAV URL. I’m prompted for my username and password, which are checked against the local NIS directory server. Once in, my requests are handled by an httpd process which uses seteuid(2) to assume my identity. That means I can see exactly the same set of files I could see if I were using NFS, FTP, CIFS with identity mapping, etc. If I’m accessing someone else’s 644 file, then I can read but not write it. If I’m accessing my group’s 775 directory, then I can create files in it. It’s just as though I were using the local filesystem. The mod_dav FAQ vaguely describes how one could do this, but implies that making it work requires introducing a huge security hole. Using Solaris’s fine-grained privileges, we give Apache worker processes just the proc_setid privilege (see privileges(5)). We don’t need httpd to run as root – we just need it to change among a set of unprivileged users. Any service expected to serve data on behalf of users must be granted this privilege — the NFS, CIFS, and FTP servers all do this (admittedly by running as root). Of course, such a system is only as safe as its authentication and authorization mechanisms, and we’ve done our best to ensure that this code is safe and to mitigate the possible damage from potential exploits. It’s built on top of libpam and (of course) Solaris, so we know the foundation is solid. mod_user is our custom module which authenticates users and causes httpd to assume the identity of said users. It primarily consists of hooks into Apache’s request processing pipeline to authenticate users and change uid’s. We authenticate using pam(3PAM), which uses whatever name services have been set up for the appliance (NIS, LDAP, or locally created users). Though mod_user itself is fairly simple, it’s also somewhat delicate from a security perspective. For example, since seteuid(2) changes the effective uid of the entire process, we must be sure that we’re never handling multiple requests concurrently. This is made pretty easy with the one-request-per-process threading module that is Apache’s default, but there’s still a bit of complexity around subrequests, where we may be running as some user other than Apache’s usual ‘webservd’ (since we’re processing a request for a particular user), but we need to authenticate the user as part of processing the subrequest. For local users, authentication requires reading our equivalent of /etc/shadow, which of course we can’t allow to be world-readable. But these kinds of issues are easily solved. Enhancing the user model is one of a few updates we’ve made for HTTP sharing on the NAS appliance. I’ll soon discuss mod_dtrace, which facilitates HTTP Analytics by implementing a USDT provider for HTTP. We hope these sorts of features to make life better in many environments, whether you’re using WebDAV as a primary means of sharing files or you’re just giving read-only access to people’s home directories as a remote convenience. Stay tuned to the Fishworks blogs for lots more discussion of Sun’s new line of storage appliances.